Yesterday was non stop for us, we had a full English breakfast at a local cafe and then walked to the local train station to enquire about getting to the airport from here but this particular station isn't like you would imagine a station to be. You cannot get inside, no ticket purchase, no staff to speak to but a nice lady at a local Accountants did tell us the website to look/book on. Nearly 200lb, so today we will contact Hertz and perhaps we can return our car to London for them :)... we'll see. We then walked to the shops to get some Lasagna ingredients and that is where Bob found us then off for a coffee and a visit. Brad spent the afternoon making the sauce with his new sous chef Jane. 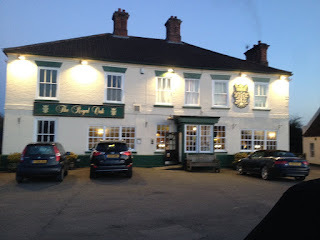 We then went to The Royal Oak for a lovely evening meal and Brad and I both had the Chicken Curry. Fabulous. Highly recommend this place for delicious and reasonably priced grub. We didn't manage to sort my phone out yesterday but did manage to find a guru that we will be going to see today. Here's hoping that all goes smoothly. It has been very difficult to get pictures for this Blog without my cell phone, funny how we get so dependent on these bloody things. Bob & Jane have a stunning back garden and I would love to post some pics of it but as yet have not thought to ask and so it must wait, I will try to remember to discuss it with them today. Today is Market day!!! Mama's going shopping!!! I will definitely take lots of pictures of that. Perhaps even one of my stealing Brad's wallet?! I'm still unsure how to take pictures when other people are in the shot. Not everyone wants their picture put online I'm sure. Anyone have the rules for this? Perhaps I could Google it... Yes, thats the ticket, I shall Google it! 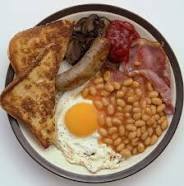 A full English breakfast for our follower Dawn, and I forgot to mention the mushrooms. A Full English consists of (proper) bacon, eggs, beans, sausage, tomatoes, toast and sometimes blood pudding. (I don't like blood pudding, btw) These days I think most leave the pudding off unless you request it. I found a pic online and will try to add it to this post.